For too long, people have been turning a blind eye to domestic violence. Many nonprofits and brands have been devising unique collaborations to grab the attention of modern society and inspire people to take action against violence against women. 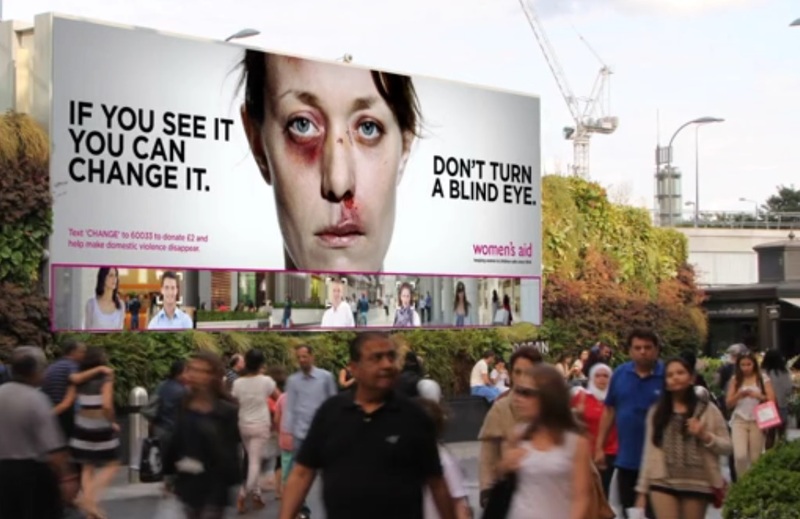 In anticipation of International Women’s Day, a billboard in London used facial recognition to show the difference awareness of domestic violence can make. London agency WCRS teamed up with Ocean Outdoor and Women’s Aid to create a digital billboard at Canary Wharf. Reading, “Look at Me. We Can Stop It,” the billboard uses facial recognition to register when someone is actually looking at the billboard. A woman who is severely beaten looks upon the passersby, blinking from time to time. As people ignore her, her image stays the same. Then, each time someone looks at her, the woman’s prominent bruises, black eyes, swelling and scratches start to disappear. In their case study, WCRS mentions that it only takes one person to notice for change to begin. The photo above is from that case study while the tweet below is from the actual campaign at Canary Wharf. The campaign hopes to raise awareness and drive donations for the non-profit.